Welcome back for the 2018 fantasy football season! 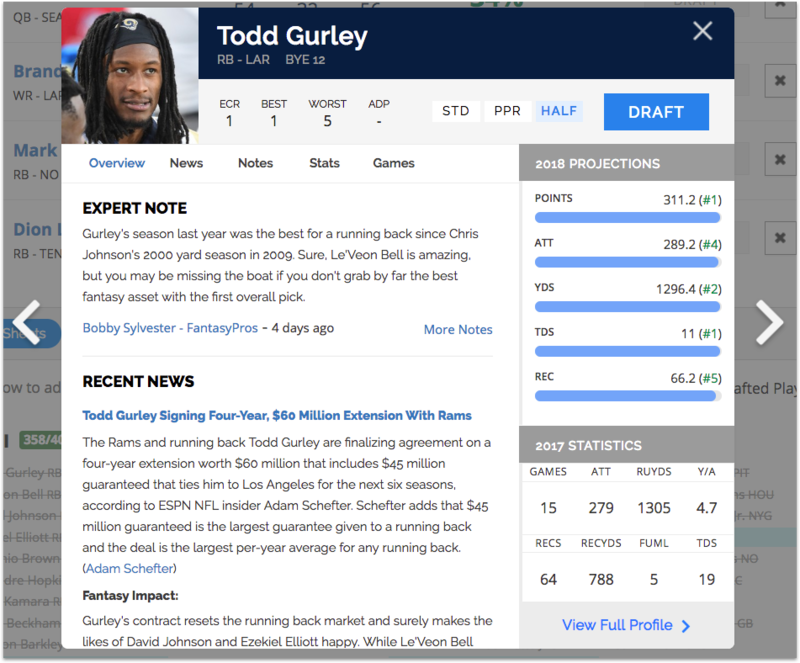 The team at FantasyPros has been working hard to deliver you some exciting new updates for the 2018 fantasy football draft season. As you know, Draft Wizard is the premiere fantasy football draft tool on the market. We aim to provide you with the easiest way to practice, prepare, and dominate your real drafts. 1. Public mock drafts: quickly mock draft against other FantasyPros users. 2. Private mock drafts: create and run a mock draft with just the people you invite. 4. New player cards: an improved way to view player rankings, information, and stats. 3. Updates to the Draft Wizard: keeper and dynasty league enhancements. Join a public mock draft with other FantasyPros users. Look, ma! No kickers in the first round! If you're tired of waiting for other mock draft lobbies to start only to have a kicker drafted in the first round, we've (mostly) solved your problem. You can now mock draft against other FantasyPros users. Check out the new mock draft lobby here. We currently offer different combinations of 10 or 12 team and STD/PPR/.5 PPR scoring. Any spots not taken by a human will be filled by one of our draft AI bots, the same bots you draft against in our Draft simulator. Similarly, you can now create a mock draft to share with your friends. This is also a great way to share on social media to draft against your fellow fantasy football enthusiasts. An exciting update for us this year is improved player cards. Some of you may have seen this earlier in the year with fantasy baseball, but we've improved the way you can see expert consensus rankings, view expert notes for players, get the latest player news, and check out their projections and stats. Plus, my personal favorite feature, you can easily view more player cards for all players on the screen using forward and back arrows (or your keyboard arrow keys). Saves a bunch of time clicking from player to player. This is integrated into Draft Wizard but you'll also see new player cards through the rest of the site. As always, our ever popular Draft Wizard offers the most realistic mock draft simulations out there. 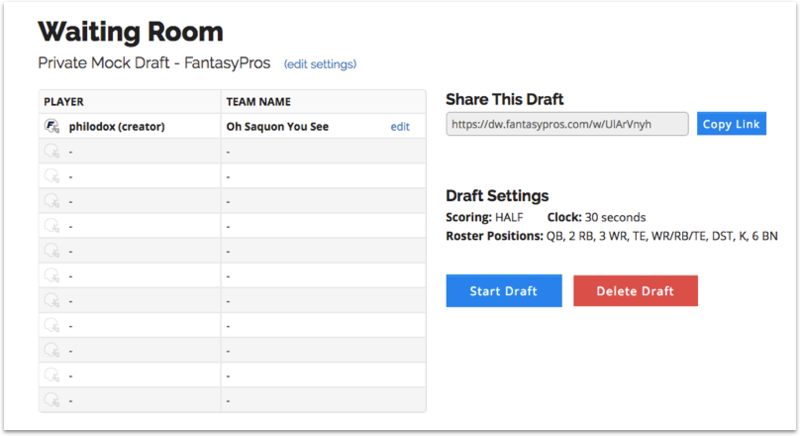 You can quickly mock draft against any number of opponents using your league settings. This year we've added enhanced support for dynasty and keeper leagues. 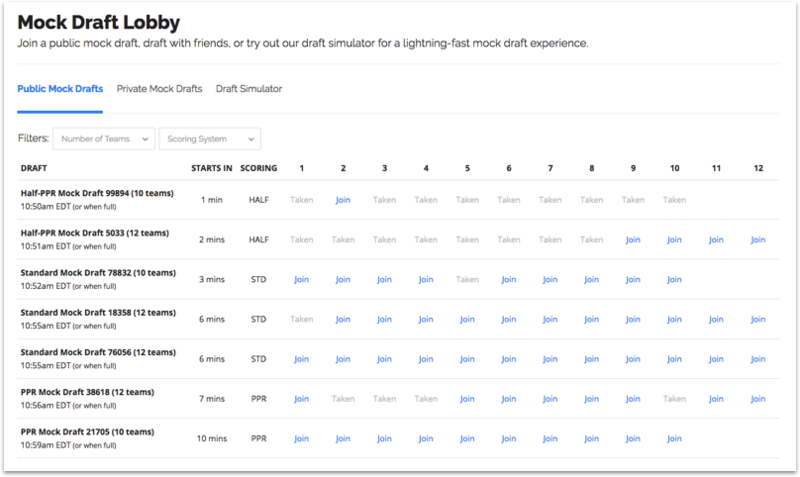 For dynasty leagues, you can now do mock draft simulations of rookie only drafts. We've also made general enhancements to our player suggestions (our secret sauce), to help you draft the best team during your live and simulated drafts. Check out the 2018 Draft Wizard here.